2016 Climate Plan-This report was developed by the Partnership for Public Health (PPH) with assistance from the Lakes Region Planning Commission with funding provided by the Centers for Disease Control (CDC) administered by the New Hampshire Department of Health and Human Services (DHHS). This is a pilot program that will guide action at the local and regional level. Two awards were made in the state and New Hampshire was one of 18 states awarded these funds. 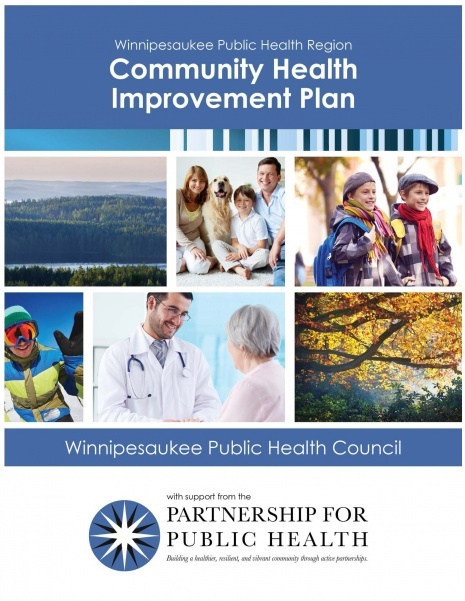 The Winnipesaukee Public Health Council presents the first Winnipesaukee Community Health Improvement Plan. This Plan builds upon the work of individuals working collectively with support provided by the Partnership for Public Health and Caring Community Network of the Twin Rivers. The collective vision is to build a health, resilient, and vibrant community for every person, and every family. During the period April through July, 2014, a Community Health Needs Assessment in the LRGHealthcare service area of NH was conducted by LRGHealthcare. The purpose of the assessment was to identify community health concerns, priorities and opportunities for community health and health care delivery systems improvement. This report compiles a variety of data describing the health of the resident population of the Lakes Region of New Hampshire. Included in this data-based portrait are selected indicators of social and economic determinants of health, access to health services, health promotion and disease prevention, illness and injury, substance abuse and public safety. This report is a summary of findings from a series of eight focus groups as an effort by the members of the Lakes Region Partnership for Public Health Data Collaborative to understand the health-related needs of the community and to plan programs and services that address those needs. A condensed report on "How's our health" including demographics and social characteristics, identifies priorities, what is being done, what will be done and what you can do taken from the 2013 Health Data Report. A snapshot of NH's Public Health Region, Counties and the Cities of Manchester and Nashua. A report providing organizations, businesses, government, and citizens’ with information to assist in the planning and development of programs that support the needs of our community members. Health and Equity in New Hampshire: 2013 Report Card This paper is one of a series published by the New Hampshire Center for Public Policy Studies on New Hampshire’s healthcare system and demographics. This particular report was funded by the Department of Health and Human Services, Office of Minority Health & Refugee Affairs (OMHRA) with support from the federal State Partnership Grant to Improve Minority Health. The analysis and opinions expressed here, however, are those of the Center alone. SIM-State Health System Innovation Plan- The New Hampshire State Innovation Model (SIM) is a planning process aimed at integrating and accelerating health transformation to achieve the “Triple Aim”: Better Health, Better Care, and Lower Costs. This five-year New Hampshire Oral Health Communication Plan (OHC Plan) is designed to serve as a guide for the marketing and communications efforts of the New Hampshire Department of Health and Human Services, Division of Public Health Services, Oral Health Program (OHP) and their partners. Charting a course to improve the health of NH. NH-SHIP provides provide support, guidance, and focus for public health activities throughout the state. Ten priority areas have been identified. Rockingham and Grafton Counties Rank Healthiest in the State in Annual Report. This Report ranks NH counties according to their summary measures of health outcomes and health factors, as well as the components used to create each summary measure. Scientists have found that the conditions in which we live, work, and play have an enormous impact on our health. This knowledge is reflected in what is called the social determinants of health model. Lakes Region Community Services (LRCS) serves the diverse needs of individuals and families living with developmental disabilities or acquired brain disorders residing in the greater Lakes Region of NH. LRGHealthcare is a not-for-profit healthcare charitable trust representing Lakes Region General Hospital (LRGH), Franklin Regional Hospital (FRH), 22 affiliated medical providers and service programs. Their mission is to provide quality, compassionate care and to strengthen the well-being of our community. They are driven by healthcare needs of the communities served, and very proud of a long tradition of providing quality healthcare services to the Lakes and Three Rivers Regions. s to improve health and health care in New Hampshire. Our work addresses quality of care, access to care and community prevention. The Foundation for Healthy Communities is an affiliated organization of the NH Hospital Association. The New Hampshire Center for Public Policy Studies is an independent, nonpartisan, 501(c)(3) organization that pursues data-based research on public policy matters, develops options, informs policy makers and advises them about choices for action. The Center’s mission is to raise new ideas and improve policy debates through quality information and analysis on issues shaping New Hampshire’s future. NH HealthCost Website- The website allows people to find out what they might pay – for medical visits, procedures, prescription drugs, and lab results – at facilities across the state. Consumers often research and compare the costs of other large expenses, for example, when buying a car or television. NH HealthCost helps consumers with shopping and comparing medical costs and quality data. This will help consumers spend their health care dollars more wisely. The New Hampshire Department of Health and Human Services (DHHS) is the largest agency in New Hampshire state government, responsible for the health, safety and well being of the citizens of New Hampshire. DHHS provides services for individuals, children, families and seniors and administers programs and services such as mental health, developmental disability, substance abuse and public health. This is accomplished through partnerships with families, community groups, private providers, other state and local government entities, and many citizens throughout the State who help make New Hampshire a special place in which to live. and comprehensive delivery of essential public health services regionally. Fourteen agencies are funded by the New Hampshire Division of Public Health Services to convene, coordinate, and facilitate an ongoing network of partners to address regional public health needs. To raise consumer awareness about the seriousness of food poisoning (also referred to as foodborne illness) and to provide solutions for easily and safely handling food in their own kitchens, the Academy of Nutrition and Dietetics (formerly the American Dietetic Association) and ConAgra Foods' public awareness campaign, Home Food Safety, is dedicated to providing home food safety statistics, information about food poisoning and safe food handling information and tips. Collaborating to create the expertise, information, and tools that people and communities need to protect their health – through health promotion, prevention of disease, injury and disability, and preparedness for new health threats. CDC seeks to accomplish its mission by working with partners throughout the nation and the world. United Nations system. It is responsible for providing leadership on global health matters, shaping the health research agenda, setting norms and standards, articulating evidence-based policy options, providing technical support to countries and monitoring and assessing health trends. In the 21st century, health is a shared responsibility, involving equitable access to essential care and collective defense against transnational threats.